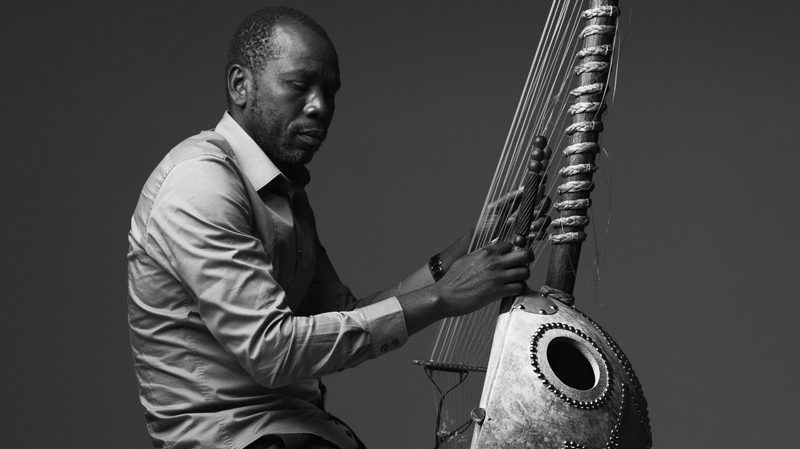 First Listen: Ballake Sissoko, 'At Peace' The Malian kora player again works with French cellist Vincent Segal in sweet and soulful ways. After all the time they've spent together in and out of the studio, the two bring a loose-limbed and relaxed spirit to At Peace. Ballake Sissoko's new album, For Peace, comes out Feb. 5. Two years ago, Malian musician Ballake Sissoko and French cellist Vincent Segal beguiled the NPR Music staff with their magical debut collaboration. Sissoko, who plays the 21-string harp called the kora, and Segal wove their instruments together in sweet and soulful ways. We loved their album-length collaboration, titled Chamber Music; we were transported by their GlobalFEST performance; and Bob Boilen ushered them quickly to D.C. for a memorable Tiny Desk Concert. After their initial project and ensuing tours that took them around the world together, Sissoko and Segal are still collaborators on this new album, called At Peace. But the way they work together here is of a different order: Segal produced the album, and appears on just a handful of tracks. They conjure up that old gorgeous magic once again, but after all their time spent together in and out of the studio, Sissoko and Segal bring a slightly looser-limbed and more relaxed spirit to At Peace. While the album isn't meant to be Chamber Music 2, the key to At Peace (out Feb. 5) is a subtle and beautiful layering of instrumental textures; the music continually crosses from melody to percussion and back again. Moreover, like that previous album, it's framed around some finely stitched fabric. There's the delicate latticework of Sissoko's solo kora in the opening track, "Maimouna," and again at the album's close in "Kalanso." When the players' ranks swell, it's only at most to an intimate quintet, as when guitar, 12-string guitar and the marimba-like balafon join the kora and cello in "Kalata Diata." With the exception of a charming and lithe cover of northeastern Brazilian artist Luiz Gonzaga's lilting "Asa Branca," all the music was either written or co-written by Sissoko, and he brings a dreamy, lovely beauty to his work. Though most of At Peace was recorded in a studio in Angouleme, France, perhaps the most transporting tune is the thoroughly charming "N'tomikorobougou." It was recorded at the courtyard of Sissoko's house in the Malian capital Bamako, with cicadas providing their own night-music accompaniment to a burning duet played by Sissoko and the guitarist Aboubcar "Badian" Diabate. It's a beautiful interlude — and it holds particular poignancy, given the turmoil in Mali that has transpired in the time since Sissoko recorded his song in January 2011. At peace? Sadly, that's still a dream in Mali, but without a doubt this powerful, beautiful album will bring listeners no small respite.